A little before Hallowe’en, I sat down at a local coffee shop with Colin, who had a treasure trove of ghost stories from Harbour Mille and Grand Bank. His family was one of the founding families of Harbour Mille, and he was full of stories about various members coming back from the dead to say hello or show displeasure about the actions of the living. Today, Harbour Mille is a small fishing village of around 200 people, sitting in the well protected harbour of Fortune Bay, about 26 km off the Burin Peninsula Highway. The town sits on an isthmus, and hills rise, saddle-like, to the west and the east. It has both a sheltered harbour at the north, and a beach to the south. Across the bay to the northwest is the now abandoned community of Bay de L’Eau. Though separated by five or six km of open water, the two communities are linked by a rather intriguing ghost story. Colin learned the Bay de L’Eau half of the ghost story from a friend, David, who also has roots in the Harbour Mille area. As the legend goes, there was a group of fishermen in a schooner, sailing in to Bay de L’Eau. 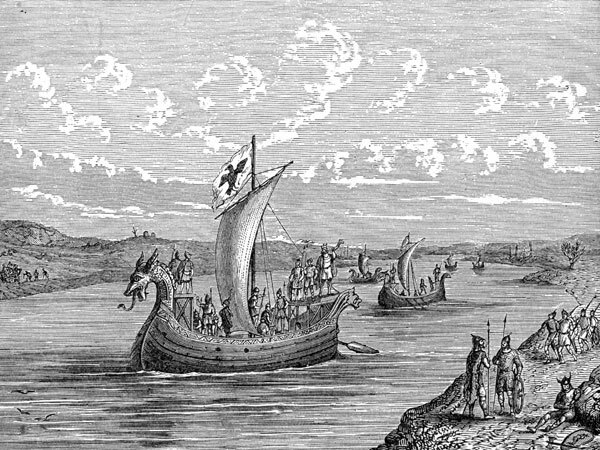 As they came close to land, they saw what they later described was a Viking ship that was coming out of the bay. The two companies parted ways, and the longship vanished from sight. Aunt Sarah was Colin’s great-grandfather’s sister-in-law, who lived in Harbour Mille in the late 1800s. Aunt Sarah was the source of the second half of the ghost story, a story passed down to Colin from his father and grandfather. There is a relatively famous Viking ship story from the area around L’Anse aux Meadows, but the Harbour Mille - Bay de L’Eau tale is the first version I have heard from Fortune Bay. His interpretation is that Aunt Sarah used the word barge to describe a long flat boat of a type she was unfamiliar with. The story of the men picking up the “barge” and carrying it across the hills is equally intriguing. Viking longships were constructed to be both light and strong; the crew of a small one could quite easily take down the mast, overturn the craft, and portage it over land to the next fjord or bay if needed. It has been argued that this capability added to the legendary suddenness and speed of Norse raiders.